Mirrors attract a lot of attention. A lot of people feel the automatic compulsion to glance at a mirror as they walk past it, regardless of whether they’re really thinking about their appearance or not. And then there are those who spend hours and hours peering into the things. Whichever category you fall into, it’s likely the mirrors in your home will be amongst the objects you look at most frequently. It makes sense, therefore, to put a fair bit of thought into choosing well-designed ones that suit your style of decor well. The mirrors featured in this ideabook cater to a wide range of tastes and should provide you with plenty of inspiration. 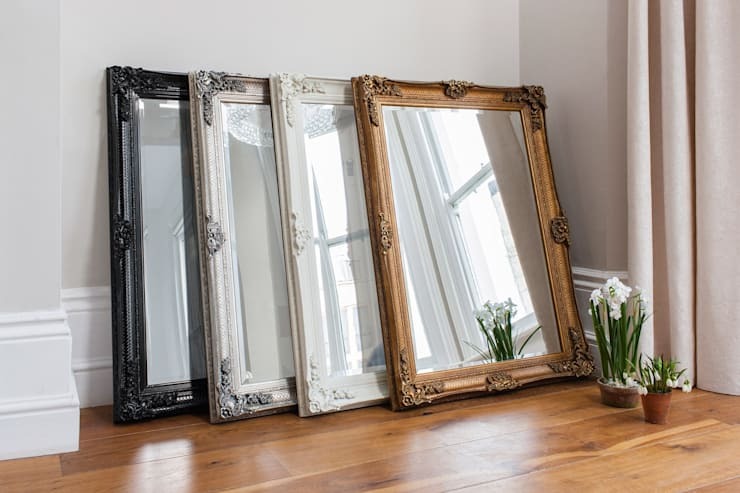 These generously sized mirrors are the epitome of regency elegance, and they would look just as good either hung horizontally over a fireplace or simply propped up against the wall as seen here. In this position, they can be used as full-length mirrors to check out potential outfits from head to toe. The two metallic colour options offer tradition in its purest form, while the white and black versions of this piece show how a little bit of modernity can be brought to even the most old-fashioned of designs with just a lick of paint. The form of this piece, with its large, round central mirror surrounded by smaller circles, is very similar to a flower or even a child’s drawing of the sun. 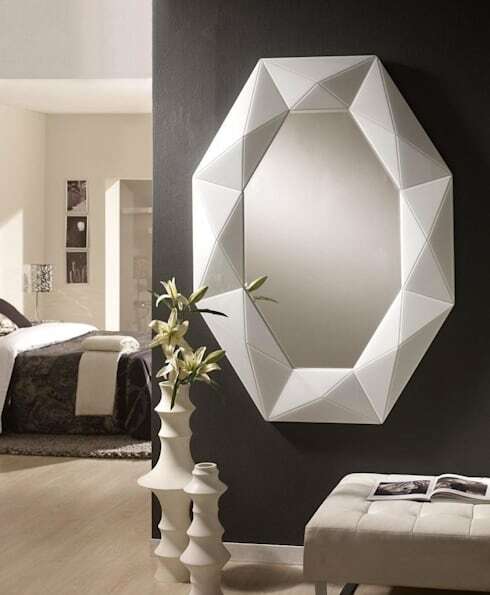 The larger a mirror is, the more light it will reflect and the lighter your rooms will seem. This one would do a good job of bringing a little brightness to dark spaces. Its playful shape is also a good match for the cheerful stripy sideboard beneath it. From sun to snow: this delicate mirror recreates the complex detail of a snowflake, or perhaps even a crack in a pane of glass. Or is it a puddle, seen right at the moment a drop of water hits the surface? Whatever the inspiration behind it, the result is quite beautiful. 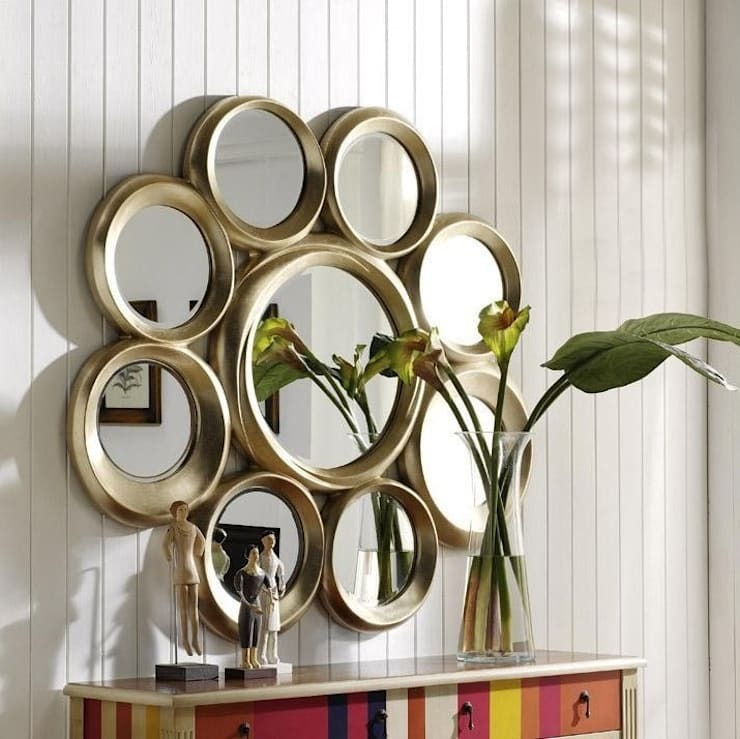 This mirror is certainly more decorative than functional, however; so make sure you put it somewhere prominent and save your more practical mirrors for the bathroom or bedroom. The biggest statements can often be made through understatement, as this very cool mirror amply demonstrates. The straight lines and simple geometric patterns created by the textured surface of the frame are perfect for this modern, monochrome bedroom. 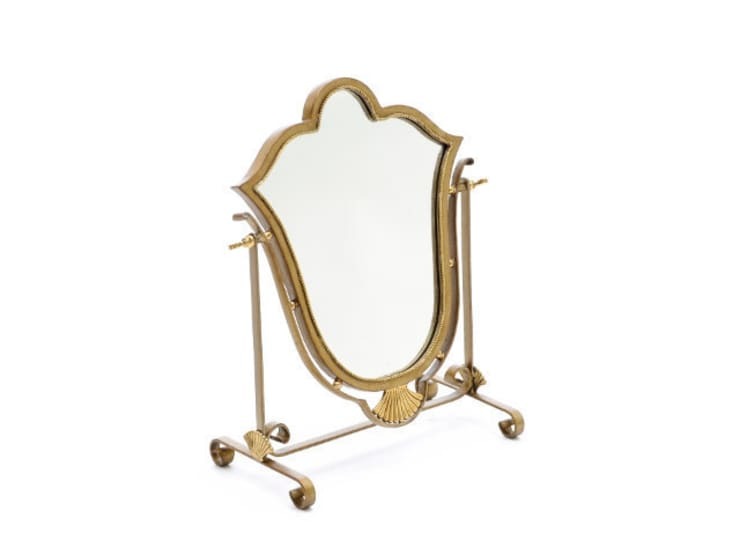 Less modern but just as nice to look at, this pretty mirror gives off Art Nouveau vibes thanks to its artistic curves, which combine to give the abstract impression of a rose. 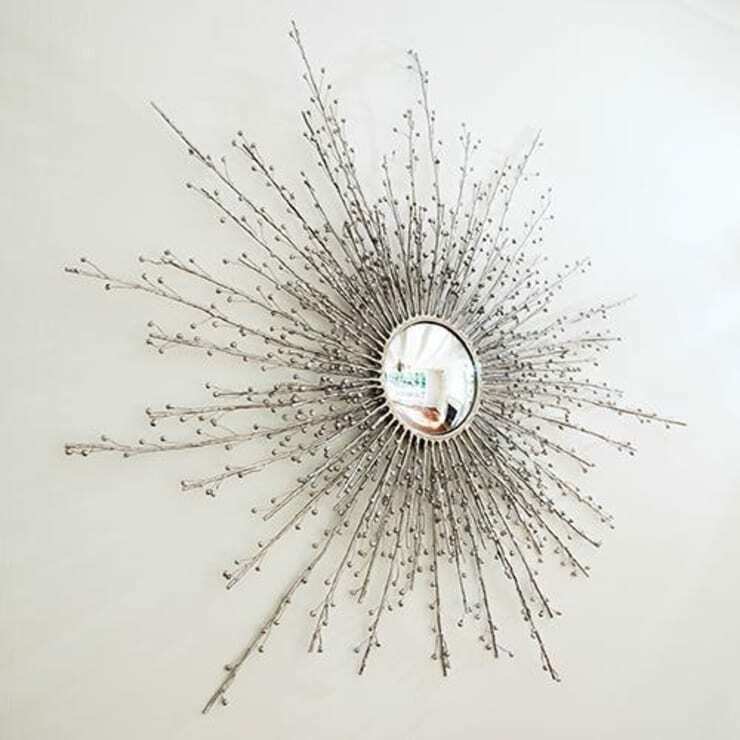 Like the snowflake-inspired mirror seen above, it’s intricate and fragile-looking; however this one is definitely a little more useable. There’s a lot to love about this showy mosaic masterpiece. It’s a very regal design – right down to the crown – but the choice of bright colours used lends a touch of something softer and less serious to the finished piece. There’s something that feels very ostentatious about putting feet on certain items. Bathtubs would be one example. Mirrors are another. 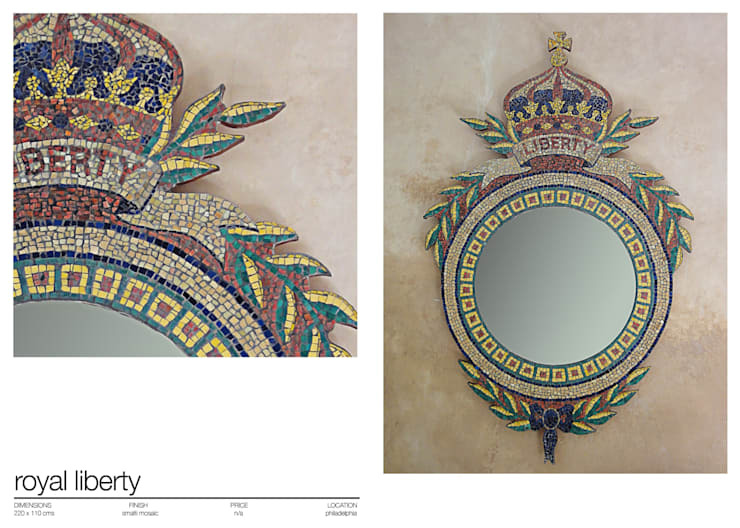 And in this case, to be fair, the mirror in question is a fairly luxurious looking one. But if you’re going to treat yourself to an indulgent item of furniture, why not go all out and have it be gold as well? It would be a wasted opportunity if you didn’t. How many mirrors do you have in your home? How many is too many?